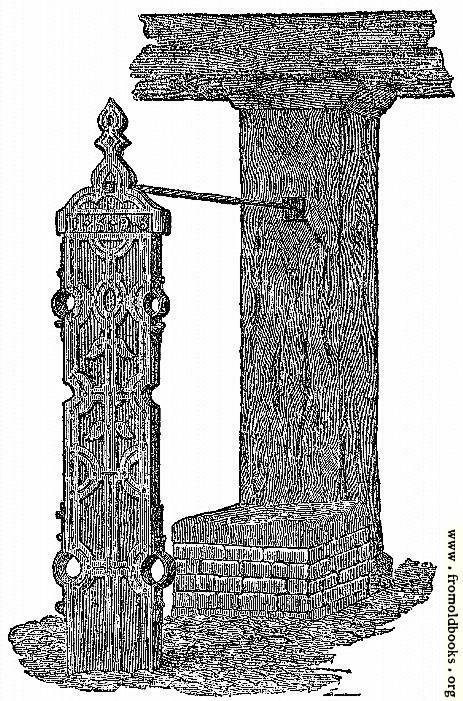 Waltham Abbey Whipping-Posts and Stocks. The Anglo-Saxons whipped prisoners with a whip of three cords, knotted at the end. It was not an uncommon practice for mistresses to whip, or have their servants whipped, to death. William of Malmesbury relates a story to the effect that when King Ethelred was a child, he on one occasion displeased his mother, and she, not having a whip at hand, flogged him with some candles until he was nearly insensible with pain. “On this account,” so runs the story, “he dreaded candles during the rest of his life to such a degree that he would never suffer the light of them to be introduced in his presence.” During the Saxon epoch, flogging was generally adopted as means of punishing persons guilty of offences, whether slight or serious. For a long time in our history, payments for using the lash formed important items in the municipal accounts of towns or parish accounts of villages. Before the monasteries were dissolved, the poor were relieved at them. No sooner had they passed away than the vagrants became a nuisance, and steps were taken to put a stop to begging; indeed, prior to this period attempts had been made to check wandering vagrants. They were referred to in the “Statute of Laborours,” passed in the year 1349. Not a few enactments were made to keep down vagrancy. In the reign of Edward VI, in 1547, an Act was passed, from which it appears “that any person who had offered them work which they refused, was authorised to brand them on the breast with a V, hold them in slavery for two years, feed them during that period on bread and water, and hire them out to others.” The Act failed on account of it sseverity, and was repealed in 1549. 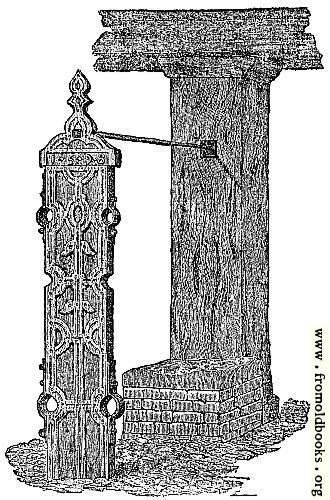 There are a number of other pictures of stocks and other punishments, both with and without people! This whipping post still exists, currently housed in the Epping Forest District Museum in Waltham Abbey. This image is historically valuable as it shows what the single hole at the top of the post was used for. The pillar shown was part of Waltham Abbey’s old timber-framed market house, which was pulled down in the 19th century. I’m in favor of re-instituting whipping as a judicial punishment, as well as a disciplinary measure in schools.